Jandah was carried out from the longhouse to be sent to a nearby clinic for further examination. MIRI: An elderly man from Rh Brauh, Sg Entulang in Bakong, Baram near here, who was reported missing on Thursday, was found safe at Sg Antu today. 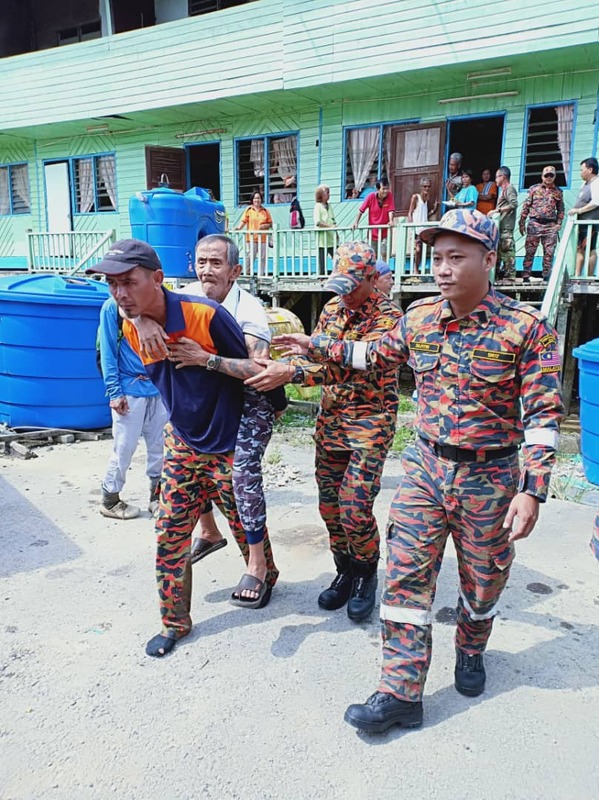 Search and Rescue (SAR) operation commander, Terry Robson, who is also Lopeng Fire and Rescue Station chief, said the man, Jandah Luang, 88, was found by the SAR team at 8.30am, at about five kilometres from the longhouse, the last location he was detected on Thursday. Today, 13 personnel from the fire station had participated in the SAR operation, which had commenced at 6.30am. “Members of Entulang Volunteer Firefighting Unit, who also participated in the operation, found the victim at a distance of 5km from the longhouse at Sungai Antu. “He was sent to a nearby clinic at Bekenu by Emergency Medical Rescue Services (EMRS) team of Lopeng Fire and Rescue station for further examination,” Terry said. On Thursday, two personnel from Lopeng Fire and Rescue Station, led by senior fire officer Rorudi Umas, were deployed to the scene after receiving a distress call at 7.30pm. A SAR operation was immediately launched around the house and farm area, but the team could not locate the missing man. The first day of the SAR operation ended at 9.45pm. It was learnt that the man had left the longhouse to trawl at a nearby river at 1pm on Thursday and failed to return home. The victim’s family began searching for the victim at 5pm after they have failed to find him at home.